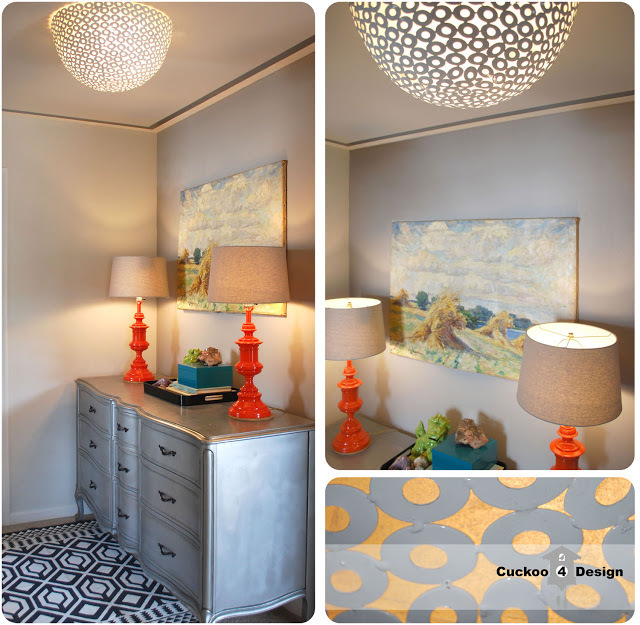 Wow, check out this Diy ceiling light from Cuckoo 4 Design! Julia made this fixture using a bowl she snagged on clearance from Home Goods for just $15...what a find! Then she mod podged tissue paper to the inside of the bowl and attached it to the ceiling right over her old outdated light. This is sooo thinkin' outside the design box. And how about those orange spray painted lamps...so fabulous! So visit Cuckoo 4 Design and get inspired. Julia is making her small house a stylish home...one creative design project at a time! Hi Jane and thank you so much! This is so sweet of you! You are welcome Robin! Seriously, creative projects like this are what inspired me to start blogging in the first place! I'm amazed at the unique ideas people come up with!